Awwwww, thanks Sibella. I’m glad you like it. It’s great to be back. Still got to iron out some stuff here, but I’m back and longing to create again. When head, heart and hands work together, it shows. Great poem, Staci. Thanks. Awwwww, thanks Rob. And yes, you are so right. When head, heart and hands work together, it shows. hahahaha, tapping your foot. Was there music going along in your head too? Awwww, thank you so much Lorrie. I had a wonderful Mother’s day actually. My home is coming together bit by bit, but yesterday we got bought a new painting, curtains, area carpet, stools for our island, and a bathroom drawer thingy. It’s so nice when your house starts to look more like a home. By the way, I tried to paint my office/creative space purple. I bought a ready made paint which was cheaper and after I was done, I hated it. So now I’m back to painting the wall cream. I should have gotten the dark purple that was twice the amount. Oh well. I’m going to wait now until something really calls my attention. Thank you Lorrie. I’m sure in due time it will come to me. As for now, I’m still working away bit by bit at this elephant. and interesting topic to bring up – the “truth” – and we were just talking about this the other day and I read somewhere (cannot recall where) but they said that truth is first resisted, ridiculed and then accepted – and the part about it being ridiculed is something I have seen – where some particular truth contrasts so much with a belief system to where a person slams and maybe even attacks the person and not the issue. and it has helped me to relax when I encounter know it alls – whether that be with issues of faith, health/nutrition, or whatnot – I know that it is only God who will lift “blinders” from someone’s cognitive blocks – and in time, truth has a way of making its way because it is so pure – like the way real silver is extracted from dross…. anyhow, sending you a housewarming bouquet via blog…. 🙂 Awwwww, thanks for the bouquet of flowers. And what a great comment. How about that eh? The truth first being resisted, then ridiculed, then accepted. I had never thought of it that way, but come to think of it, it’s so true. Thanks for the comment and insight Prior. my pleasure Stac – and I wish I could recall where I read or heard that – cos there was more I wanted to check out with it. But it does remind me to be more patient when people slam what I know to be true. Especially in the area of health issues I see this ridicule – people seem to be such “know it alls” – which might just be a human condition. I’m super interested in the ‘health issues’ thing. Could you share more on that please? Like your views and stuff? sure – can i come back and share later? I am just ctahcing up and then on my out. Also, later this month I am doing a health post with 33 key things I have learned (something like that) when it comes to health issues – and I will come back and let you know when I get to it. but I will be back later this week to share a few of the things I see that people resist the most. Wonderful. Thanks so much Prior. I can hardly wait to read it. Staci, lovely poem, always a wonderful post. I’m please to hear that you are getting settled, I hope all is well, please take good care! Heyyyyy Pepperanne, so great to hear from you. And thank you so much. I am doing well, although still not totally settled. Bit by bit things are coming together. Thank God you are back…first that you have the house in order, and that provides that wonderful peace of mind which we all keep pursuing, and second we all have been missing you badly. 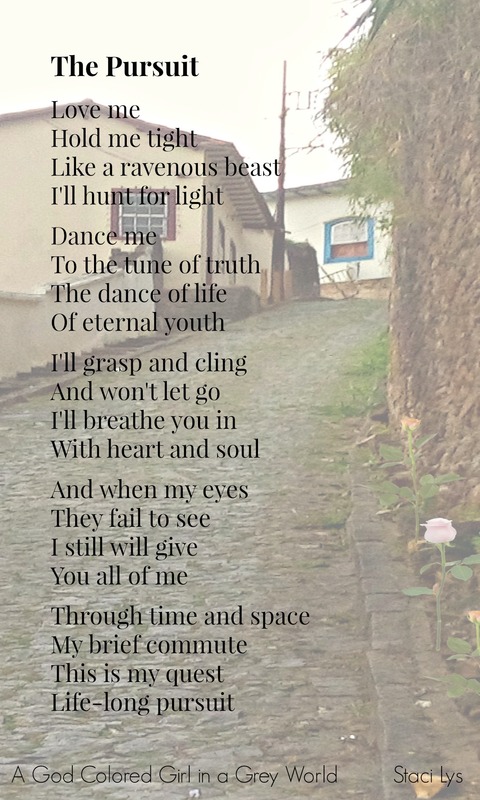 Indeed the poem is a beauty…tune of truth and eternal youth, are such gripping phrases that the more you think the more you get lost in its profound meaning. Looking forward to continue our meaningful and lovely discussion, a break is always good to give the impetus to our creative thinking. Hope you are enjoying in your new home order. Hi Nihar. Awwwww, thank you so much. You’re so kind. I’m so glad you liked the poem. My house is still not totally in order, but it’s coming along. I was actually over at your blog the other day, but I read it by phone and don’t like to comment often by phone. Now that I’m back on the computer I’ll head on over and share my thoughts. Thank you so much Indah. I’m so glad you liked the poem. Oh yes, pursuing the truth is my life-long pursuit. It’s great to see you back on your blog, Staci! I loved the poem and found it to be focused and powerful. One of your best! As far as the pursuing something, I find myself looking, seeking for something meaningful to pursue. Yes, I’ve pursued materialistic things in my life, but those things are like a sugar rush. They appeal to you while the sugar surges through your veins, only to let you down and feeling empty afterwards. Life is a whirlwind still, and I have little time to catch my breath. But I do look forward to a spiritual pursuit at some point. Something meaningful and enlightening. I don’t know when it will happen, if it will be my choice, or if it will be presented to me. Time will tell. You always have the best comments Rob. And I’m so glad you like the poem. One of my best? Really? Wow, thank you so much. I love what you said about the pursuit of material things. The whole ‘sugar rush’ analogy is great. And the whole being let down and empty feeling thing. I once heard something about how there’s an empty hole in each and every human being that only God can fill. I also tried to run after all sorts of things (material, spiritual, emotional) in my life. None of it filled that empty space. And then… well, the rest is history. Actually present and future too. Hehehe. Awwwwww, you’re so sweet Rob. Thank you for such kind words. Hope you’re having a great start to your week. the poem, photo is like a music melody…. Hahaha. New normals can take some time. Wonderful poem, Staci. The Truth brings me such comfort – definitely worth the pursuit!! It is good to have you back here on WP. I’ve truly missed you and your inspiring poems. Awwwww, you are so sweet Kirsten. Thank you so much. It’s good to be back.